When the summer heat really gets going like it has been this week, is there nothing better than ice cream? What about peanut butter ice cream with chocolate and peanut butter cups? Yeah…there’s nothing better than that! This torte is a little creation Kyle and I put together back in May based loosely on a few different concepts we’ve seen floating around, including an incredibly overpriced ice cream cake from a certain ice cream restaurant based in the Northeast. This torte is no more difficult to put together than any other cake but it definitely takes some time and patience (which I often have little of when it comes to waiting for homemade ice cream). As they say though, good things come to those who wait and since I waited all day one Saturday for this treat, I was handsomely rewarded after dinner that night. This torte is to.die.for. I’ve made this peanut butter ice cream before but the milk chocolate ganache takes it over the top. We considered an Oreo cookie crust however, as much as I would never turn down an Oreo, I’m not a huge fan of it in a crust form. We opted instead for a graham cracker crust with just a hint of cinnamon and the extra level of flavor the crust lends to the torte is just amazing. It’s like the graham crackers were meant for this torte! So since we’re still in National Ice Cream Month, why don’t you give this torte a shot! To make the ice cream: Purée the peanut butter, sugar, half and half, salt, and vanilla in a blender or food processor until smooth. Chill the mixture thoroughly in the refrigerator, then freeze it in your ice cream maker according to the manufacturer’s instructions. Chill the mixture for 1 hour in the freezer before adding to the springform pan. To make the crust: While you wait for the mixture to chill in the refrigerator, butter a 9″ springform pan – choose one that has sides that are 2 3/4″ high. Stir the crumbs, sugar, cinnamon, and salt together in a medium bowl. Pour over the melted butter and stir until all of the dry ingredients are uniformly moist. ( I do this with my fingers.) Turn the ingredients into the springform pan and use your fingers to pat an even layer of crumbs over the bottom of the pan and about halfway up the sides. Don’t worry if the sides are not perfectly even or if the crumbs reach slightly above or below the midway point on the sides. Put the pan in the freezer while you preheat the oven. (The crust can be covered and frozen for up to 2 months.) Center a rack in the oven, preheat the oven to 350 degrees F and place the springform on a baking sheet. Bake for 10 minutes. Set the crust aside to cool completely. 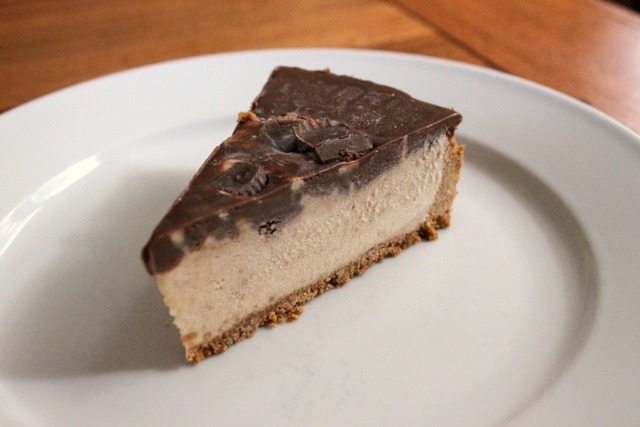 To prepare the torte: After the ice cream mixture has chilled in the freezer for 1 hour and the crust has cooled completely, stir the ice cream to loosen it a little then pour it into the crust. Smooth the top of the ice cream out with an off-set spatula. Move the pan to the freezer and free the ice cream until it is completely frozen, about 6 hours. Before removing the pan from the freezer, put the chopped chocolate in a heatproof bowl set over a saucepan of simmering water. Leave the bowl over the water just until the chocolate softens and starts to melt, about 3 minutes; remove the bowl from the saucepan. Bring the 1/2 cup of cream to a full boil. Pour the cream over the chocolate and, working with a rubber spatula, very gently stir together until the ganache is completely blended and smooth. Pour the ganache over the torte, smoothing with a metal icing spatula. 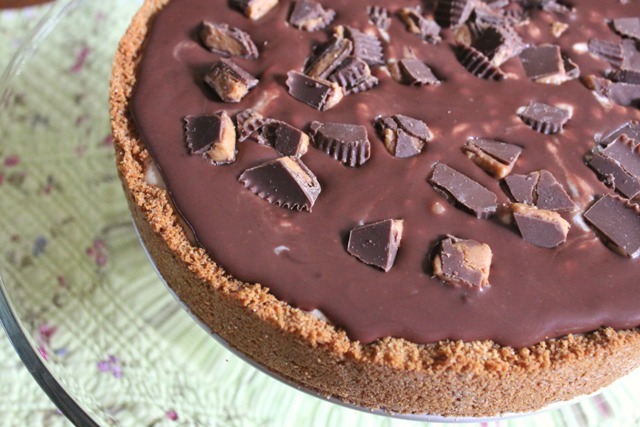 Scatter the chopped peanut butter cups over the top and freeze to set the topping, at least 30 minutes. When the ganache is firm, remove the sides of the springform pan. Keep the torte frozen until ready to serve. Allow the torte to sit at room temperature for about 10 minutes before slicing. To slice, heat a sharp knife with hot water and slice through the torte. It’s gorgeous! And delicious we’re sure…! Never ones to turn down peanut butter…or ice cream actually…this looks right up our alley. Yum yum yum! Thanks for posting! oh goodness gracious this looks amazing. i bet this is a serious crowd pleaser! amazing! This looks amazing beyond belief! This looks so rich and delicious! Summer really is all about ice cream!! I’m planning on making Chocolate Chip Cookie Ice Cream Cake this weekend. Or if I’m in the mood for peanut butter, maybe I’ll try yours! Thanks for sharing! What a yummy-looking torte! I must try this out soon. When the weather heats up again, I am so making this…YUM.